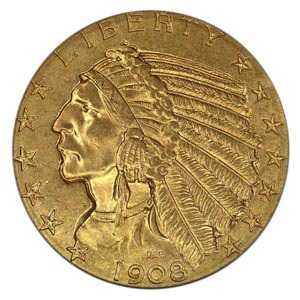 The $5 Indian Head Half Eagle, or $5 gold piece, was a coin with considerable clout in the early 1900s. After all, it represented a full day's pay for well-paid workers. 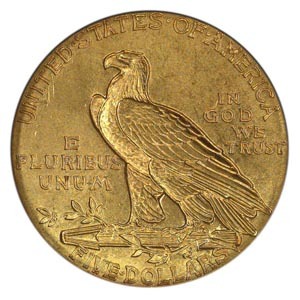 These Indian Head gold pieces are unlike any other coins produced before or since by Uncle Sam: Their designs and inscriptions are sunken below the surface of the coins, rather than being raised. Sadly many $5 Indians were melted down due to President Franklin Roosevelt's Executive Order of April 5, 1933.